Users are now able to annotate Tigerstripe project references very similar to how they'd annotate Tigerstripe modules. Annotations on tigerstripe modules are now displayed in TS explorer. The corresponding preference option must be turned on to leverage this feature. See 'Explorer' preference page under Tigerstripe. This defect fixed an issue with items disappearing from Problems view after running a clean build. In certain cases association qualifiers were not being displayed on diagrams. This was a regression which broke the ability to convert Association to Association Classes on a class diagram. There were major design changes made to the Annotation Framework to ensure that the Annotation Storage File is saved within the project as opposed to the workspace. In the past, certain scenarios would lead to the annotation storage file being stored in the user's workspace. This was a regression where artifact relationships were not carried over when they were dragged and dropped on class diagrams. This was a problem with removing annotations via the context menu of artifacts in class diagrams. There was an issue with association annotations being displayed on class diagrams, which is now resolved. 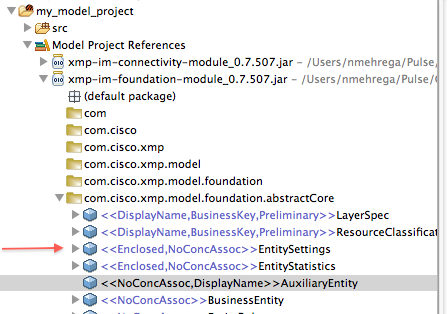 In certain cases annotations would only be displayed in Tigerstripe explorer and not on class diagram. This was a regression where double clicking on a referenced project in Tigerstripe Explorer would result in an error. This page was last modified 11:45, 1 September 2011 by Navid Mehregani.